Point Pleasant senior Bailey Barnett runs down a forehand attempt during a second singles match against Huntington Saint Joseph Wednesday night in a non-conference contest at The Courts in Point Pleasant, W.Va.
Point Pleasant sophomore Dylan Tayengco hits a forehand attempt during a second singles match against Huntington Saint Joseph Wednesday night in a non-conference contest at The Courts in Point Pleasant, W.Va.
POINT PLEASANT, W.Va. — A half-dozen matches … and not a single loss. 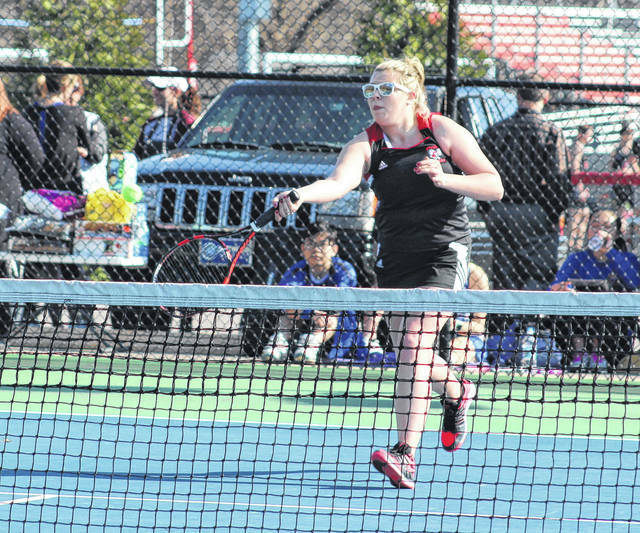 The boys and girls tennis teams at Point Pleasant have collectively posted a 5-0-1 record over three days this week following a trip to Poca and a pair of home events against Lincoln County and Huntington Saint Joseph at The Courts in Mason County. The Black Knights improved their seasonal mark to 4-2 overall after going 3-0 over that three-day span, posting a 5-2 win at Poca before coming home to earn a 7-0 win over Lincoln County on Tuesday and a 5-2 decision over the Irish on Wednesday. Dawson Wilson claimed a 9-7 win over Isaac Neal in first singles against the Dots on Monday, while Dylan Tayengco earned an 8-2 win over Trent Covert in second singles. Carson Chambers also posted an 8-3 victory over Jack Piekarsh in fourth singles. Wilson and Tayengco combined for a 9-7 win over Neal and Trey Bush in first doubles, while Nick Smith and McKeon Justus netted an 8-5 win over Issac Peters and Maven Meadows in third doubles. Luke Blain lost to Bush in third singles, while the Poca duo of Covert and Piekarsh defeated Blain and Chambers in second doubles. PPHS dropped just six games in seven matches against Lincoln County on Tuesday, leading to a perfect 7-0 outcome. Wilson won 8-0 over Sam Smith in first singles and Tayengco was an 8-0 winner over Josh Adkins in second singles. Blain claimed an 8-5 win over Reece Frye in third singles and Chambers netted an 8-0 decision over Jonathan Phillips in fourth singles. Wilson and Tayengco posted an 8-0 victory over Smith and Adkins in first doubles, while Blain and Chambers defeated Frye and Phillips in second doubles by an 8-1 count. Smith and Justus also claimed an 8-0 victory in third doubles. 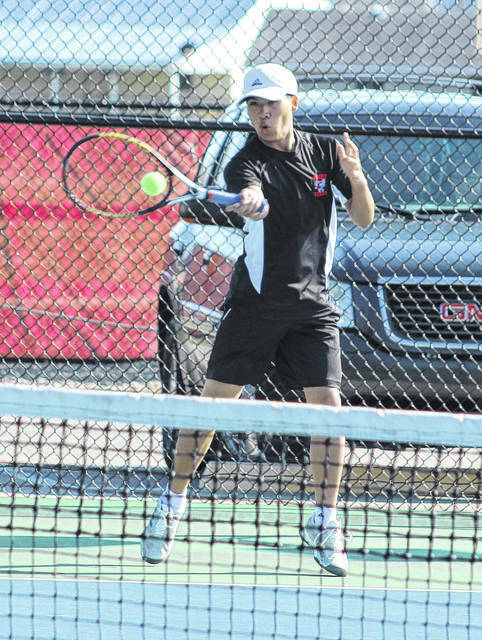 Point Pleasant completed its 72-hour run with a 5-2 victory over St. Joe on Wednesday, with Wilson earning a hard-fought 8-5 win over Armaan Karimpour in first singles. Blain posted an 8-0 victory over Josh Nguyen in third singles, while Chambers picked up a forfeit win in fourth singles. Tayengco suffered an 8-2 setback to Hayden Cooper in second singles. Karimpour and Cooper handed an 8-3 setback to Wilson and Tayengco in first doubles, but Blain and Chambers rallied to pick up an 8-0 victory in second doubles. Smith and Justus also posted an 8-1 win in third doubles. The Lady Knights improved their season record to 4-1-1 overall after going 2-0-1 over that three-day span, posting a 7-0 win at Poca before coming home to earn a 5-2 win over Lincoln County on Tuesday. The Point girls also split a 3-3 decision with the Lady Irish on Wednesday. The Lady Knights surrendered only four games in seven matches against the Lady Dots on Monday, which included a trio of love outcomes. Bailey Barnett was an 8-0 winner over Aiyana Woodall in second singles and Caroline Foreman posted an 8-0 victory over Kobi Burke in third singles. Olivia Pyles was an 8-1 winner over Asia Davis in first singles and Sarah Deem picked up an 8-1 win over Tierney Meadows in fourth singles. Pyles and Barnett defeated Davis and Woodall by an 8-0 count in first doubles, while Foreman and Deem secured an 8-1 win over Burke and Meadows in second doubles. Danielle Marcum and Olivia Martin also defeated the Poca duo of Heather Eva and Mackenzie Smith in third doubles by an 8-1 margin. Zoe Enos picked up an exhibition victory for PPHS with an 8-2 decision over Avery Richardson. Three of Point’s five losses over the final two days at home came from forfeits, including both of Lincoln County’s wins on Tuesday. Pyles picked up an 8-0 win over Madison Bowman in first singles and Barnett was an 8-2 winner over Mackenzie Dunlap in second singles. Deem also posted an 8-0 victory over Makenna Gallion in fourth singles. Pyles and Barnett combine for an 8-1 win over Bowman and Dunlap in first doubles, while Marcum and Martin posted an 8-0 victory over Gallion and Madison Dean in third doubles. Mikayla Toppins picked up a forfeit win in third singles for LCHS, then joined Kaylyn Elswick in second doubles on another forfeit victory. Only six matches ended with results on Wednesday as both St. Joe and Point Pleasant had a double forfeit in fourth singles. The Lady Irish picked up a forfeit win in third singles, while Deem and Grace Teichman netted a forfeit win for PPHS in second doubles. Barnett defeated Lainey Blatt by an 8-2 margin in second singles and the Point duo of Marcum and Martin secured an 8-2 win over Taryn Queen and Anne Blatt in third doubles. Audrey Heaberlin defeated Pyles by an 8-1 count in first singles, then joined Lainey Blatt in handing an 8-2 setback to Pyles and Barnett in first doubles.